His rhythmically astute yet flexible fingerwork, lean yet well-modulated sonority and stylish intelligence serve all tree Op 10 Sonatas as well as the catalogue's reference versions (...). The 'Waldstein' holds much to admire, such as the first movement's crystal-clear left-hand articulation and the pianist's uncompromising observance of the Rondo's controversial long pedal markings (...). His organic drive and dynamism keep the 'Appasionata's' Allegro assai vibrantly afloat. The Andante con moto seamlessly unfolds by virtue of the pianist's assiduous tempo relationships between variations (...). The pianist's insightful bookletnotes and Ondine's state-of-the-art sound deserve more than a token mention. There's no doubting the brilliance of the pianism on display here, nor that Jumppanen vividly conveys the impetuousness of Beethoven's writing, especially in the Op. 10 series (...). His performances offer much food for thought. 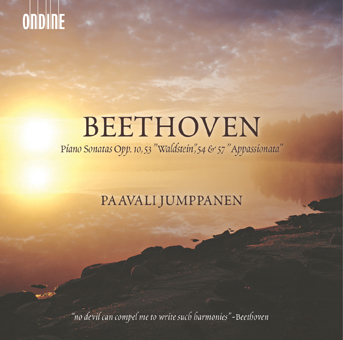 This double-CD release is a second volume in pianist Paavali Jumppanen's ongoing recording cycle of the Beethoven piano sonatas. This new release contains six piano sonatas: three early Op. 10 sonatas (published in 1798) and three sonatas written between 1804-06 (Opp. 53, 54 & 57). Piano Sonata Op. 53 Waldstein, completed after the 3rd Symphony, was described by Wilhelm von Lenz, an early biographer of Beethoven, as a "heroic symphony for piano." Piano Sonata Op. 57 Appassionata is undoubtedly Beethoven's darkest and most aggressive work. The Sonata has been compared to Dante's Inferno and Shakespeare's bloodthirsty Macbeth. Jumppanen's first instalment in the Beethoven cycle received thrilling reviews and, among others, the ‘Choc' Award from the French music magazine Classica.